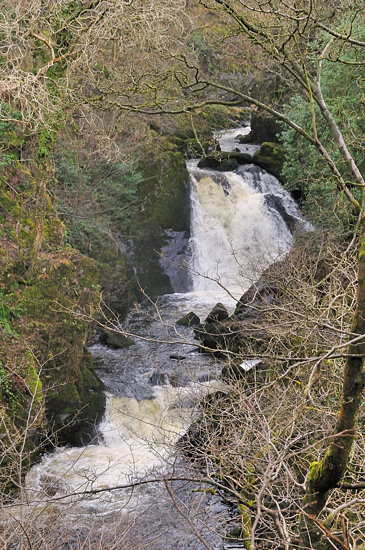 The last of the labelled falls, going clockwise, on the Ingleton Waterfalls Trail, although there are more. You look back to see Snow Falls. Snow Falls is in or next to Twistleton Glen, and its woodland sits on the west bank of the River Doe. It is owned and managed by the Woodland Trust and is a site of Scientific Interest. The rock step, into which the Glen is cut is formed because of the different resistance to erosion of the rocks laying each side of the Cavern Faults. The stepped outcrops have created cascades and waterfalls, in particular Snow Falls. The dominating tree species here is Oak, because of the acidic slate as opposed to limestone on the River Twiss. The flora is dominated by grasses, although you may see some wild garlic and typical moorland/heathland species such as bracken and fern. The only access to this woodland is via the paths provided for the Waterfalls Trail, from where the final footbridge takes you across the River Doe into another wide rocky dell, where again some stop to take a picnic. Smaller waterfalls continue through this area and particularly from the last ridge you get to see some up close. This waterfall is one of a number located on the Ingleton Waterfalls Trail access is available from this trail which is open to the public (with charges), see walks location guide for common details. Waterfall on trail before is Baxenghyll Gorge going clockwise. There are a number of small waterfalls below this point, but we don't have them defined separately.